The podcast version of WYPL’s syndicated radio program, Book Talk. Vince Vawter has over forty years experience in the newspaper industry. In 2013, he published his first autobiographically inspire novel Paperboy, which was widely acclaimed and won a Newberry Honor. 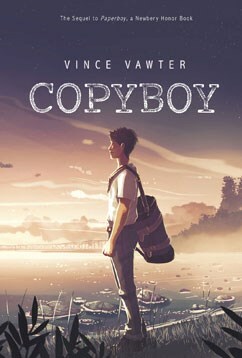 Today we'll be talking about its sequel, Copyboy, which is published by Capstone. His protagonist, Victor Vollmer has a stutter, much like Vince has. In order to honor Vince and Victor's situation, I won't be editing our conversation as I normally do. It has only been cut for length. You'll hear Vince in his true voice, and you'll hear me in mine.